Sahara India is an Indian business group with diversified interests in finance, infrastructure and housing, media and entertainment, consumer retail business, and manufacturing and information technology. The group is a major promoter of sports in India, and is the main sponsor of Indian cricket but have decided to terminate the deal after running into trouble with the BCCI recently when they scratched his IPL team Pune Warriors. They own 42.5% stake in Formula One's Force India Formula 1 Team and also sponsor the India national field hockey team. Other businesses include the construction of Amby Valley City in Maharashtra near Lonavala off the Mumbai-Pune Expressway. The city is spread over 10,600 acres of land. However the company and its boss Subrata Roy have always been dogged by controversy. Now the Supreme Court has ordered Roy not to leave the country without its permission in the matter of handing over title deeds of its properties worth Rs. 20,000 crore to SEBI. What does this development mean for Roy, and his future business prospects? Also, will it tarnish his personal reputation and the goodwill of his company Sahara India? Ganesha finds out with the help of Vedic astrology. In Subrata Roy's Surya Kundali, a malefic planet like Ketu is posited in the 6th House whereas Rahu is in the House of Court and Related Matters. As a result, he will have to face legal hassles every now and then. Positive planets like Jupiter and Mercury are Swagruhi in his Surya Kundali. Ganesha observes that they are retrograde and therefore not providing enough support to his Surya Kundali. This factor is certainly working against him as it allows the negative planets to intensify their unfavourable influence. 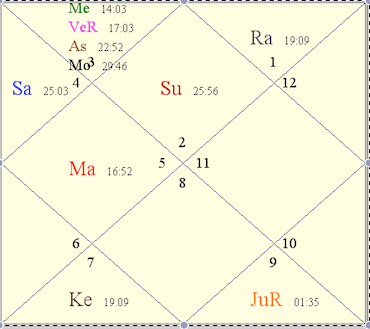 It is also noteworthy that in Subrata Roy's Kundali, now Saturn-Rahu-Mars are transiting through the 6th House. And, as aforementioned, Ketu is already posited there since birth. Plus, through the House of Expenses and Losses, the transiting Ketu is moving over Rahu in Mr. Roy's Kundali. This, very understandably, is not a favourable planetary situation. This kind of planetary situation shall continue till July 2014. At present, Saturn is transiting over Natal Ketu whereas transiting Ketu is moving over Natal Rahu. On the other hand, transiting Jupiter is moving over Natal Mercury-Venus-Moon combination. 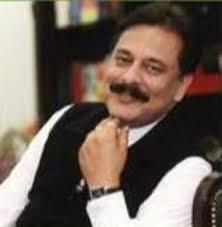 Ganesha predicts that Subrata Roy will have to face challenges, especially the ones related to law, at least till July 2014. However, in the mean time, he will be able to find solutions to his problems. The planetary movements indicate that the period after 1.5 years looks set to be better for him. Basis the recent planetary transits, it can be surmised that from 03/03/2014 to 25/03/2014, Subrata Roy may be facing a tough time. The situation may remain very unfavourable for him, and that is why he will need huge doses of patience and perseverance to keep himself stable. However, once Jupiter transits over his Natal Mercury-Venus-Moon, he may get some solution, assures Ganesha. Yet again, during 14-04-2014 to 15-05-2014, when the Sun would be transiting through the Zodiac Sign Aries – which is the Sign where his Natal Ketu is posited. Subrata Roy will have to take a very good care during this time. This may be a difficult period for him.